Colleen is in charge of all things paper for the company. She works out of a dark and spider-filled studio in her garage. Ever the environmentalist her mission is to create paper using earth-friendly practices and materials. The process starts with whatever fiber is being used to make the paper. Old clothing is the fiber of choice for our papers. So those clothes that are too run down to donate to the thrift store…Repeat Paperie will take them! They must be cotton or linen only. 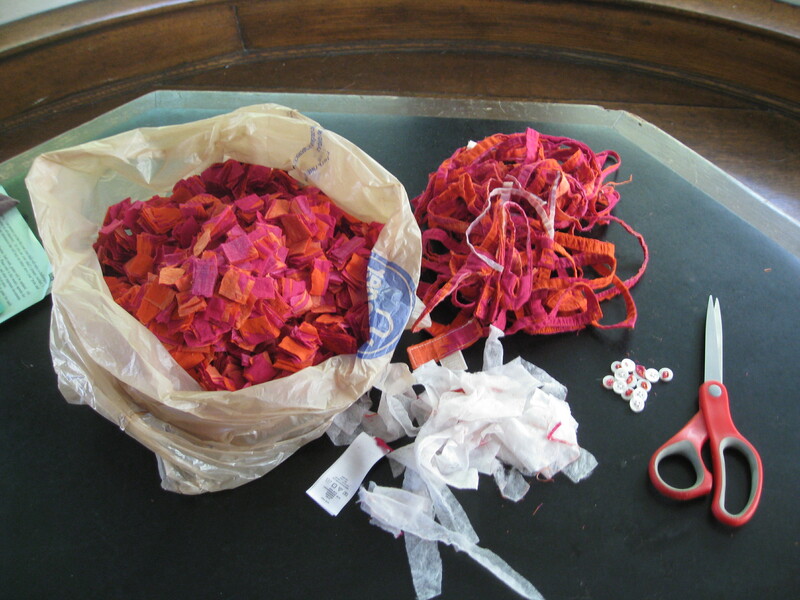 The fabric must be cut into one inch squares and all buttons, zippers, seams*, etc have to be removed (*these leftover fabric scraps make great pet toys and often don’t end up in the trash). The small squares of fabric are then soaked overnight. After soaking they are processed with water in a machine called a beater. 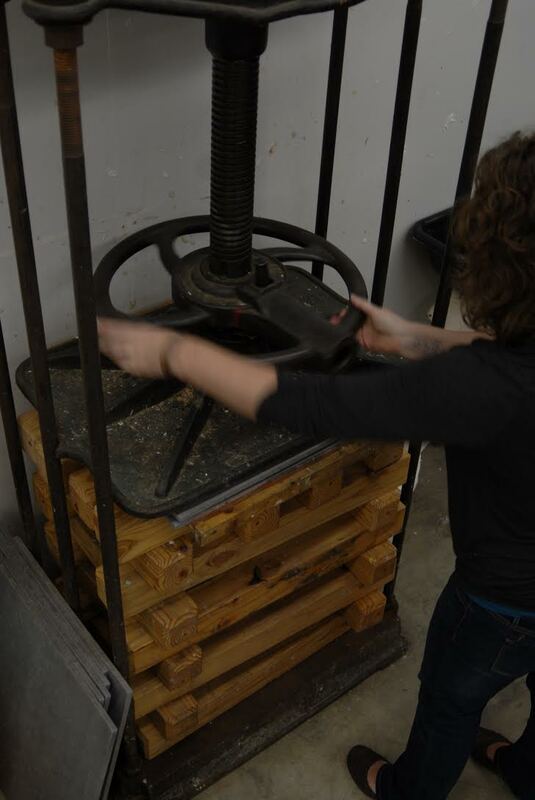 Our model is a Reina hollander beater that was handed down to Colleen from her talented father-in-law, Dolph Smith. The beater breaks apart the fabric and after a few hours turns it into pulp. If you’d like a more detailed description about the beating process read this article from Hand Papermaking magazine. Once the pulp is ready certain additives might be mixed in for different effects. The only additive we use is sizing, which makes the final paper slightly water-resistant so that inks and other wet media do not bleed through and feather on the paper. To achieve the vibrant colors we use we simply choose clothing that is already dyed that color. 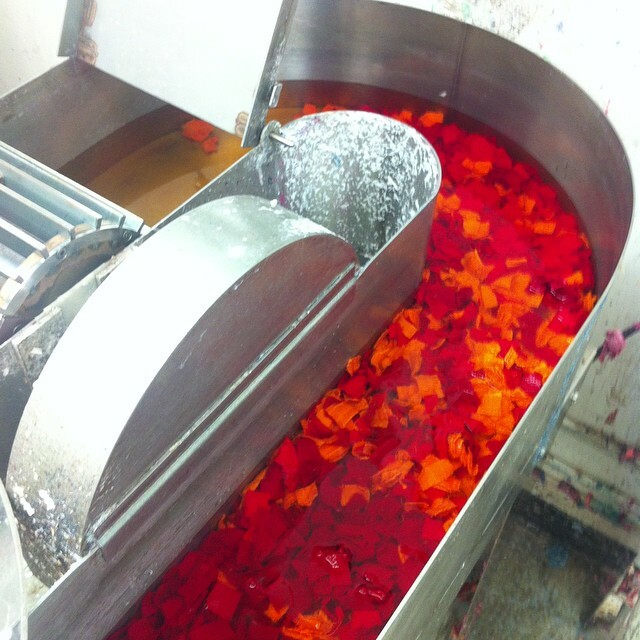 This prevents us from having to use pigments and the additives that make the pigments set into the pulp. So those old clothes are getting a spectacular repeat performance! Once the pulp is ready it is mixed into a vat of water. A special frame and screen, called a mould and deckle, is pulled through the vat to collect pulp. After coming out of the vat the water drains out of the mould & deckle and the pulp settles onto the screen of the mould. As soon as the right amount of water has drained the deckle is removed and the fresh sheet of paper is couched (pronounce cooched) to a damp felt. A new felt is placed on top, to protect the sheet, and the process gets repeated. This layering of wet paper & felt is called a post. Once the papermaker has added enough layers to his or her post (and before it gets too heavy!) it is then carried over to a press. At the press a significant amount of pressure helps expel the excess water out of the new sheets of paper. 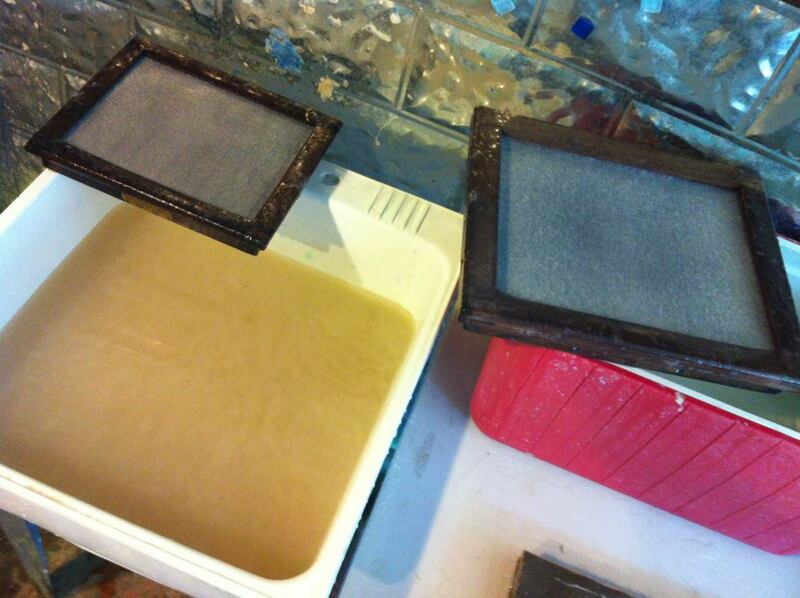 The pressing not only gets rid of the extra water it encourages the fibers of the paper to bond together. After the papers are pressed they are carefully transferred to a drying system. The drying system usually consists of tri-wall cardboards, cotton blotters, weight or some source of pressure, and fans. It takes about 2-3 days for our papers to completely dry. We are working on getting a better and quicker system but for now we will make due with what we have. A less-fancy and handmade version of this one is on our wishlist. Once the papers are dry Colleen sorts through them and sets aside the sheets that have errors or are otherwise not suitable for printing. These sheets can be added to a new batch of unbeaten fiber so they don’t go to waste! The good sheets are then sent to Eszter so that she can work her letterpress magic on them. If you are ever interested in taking one of our workshops watch our Facebook page for updates! We will probably wait until spring to offer them but hope you all would be interested! The Repeat Paperie is freshly hatched but oh so ready to get the show on the road. We will start out by creating handmade cards, gift tags, and ornaments for this holiday season. The Tsunami Winter Farmers’ Market is kind enough to let us have a booth space during their Saturday markets and we hope to sneak into a few holiday sales as well. Our marketing coordinator can hopefully convince a few local shops to carry our goods as well. After the holidays we will evaluate our progress and begin to venture into the wild world of custom invitations. Stay tuned!